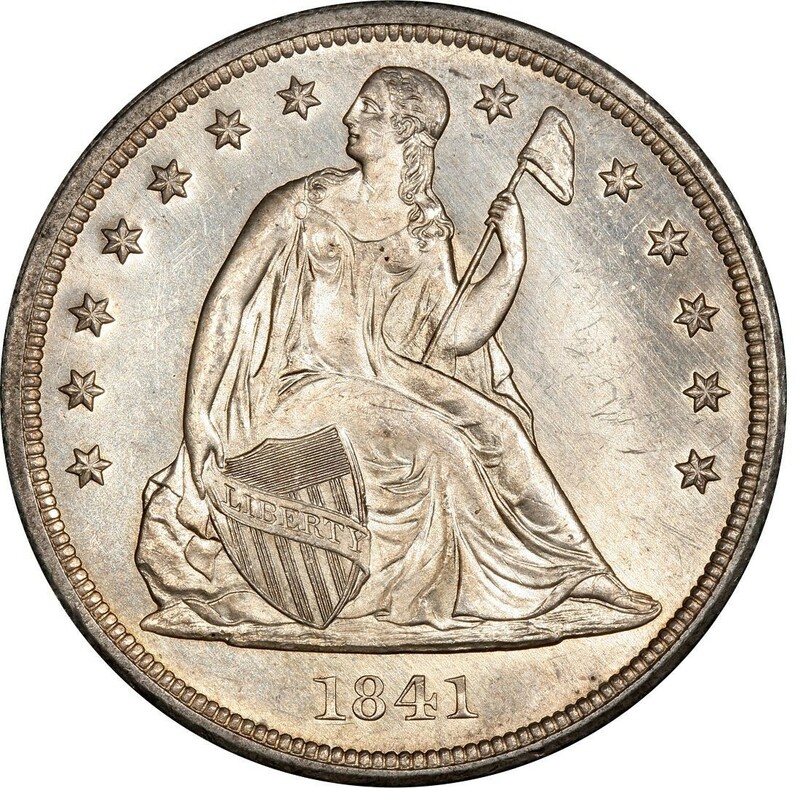 1841 Liberty Seated dollars are scarce coins that are popular among United States type coin collectors. Designed by United States Mint engraver Christian Gobrecht, Seated Liberty silver dollars were issued by a variety of mints over their three-decade run, including the Philadelphia, New Orleans, Carson City, and San Francisco Mints. The silver dollars were struck from 1840 through 1873 and experienced widespread use in the United States mainly during the 1840s and 1850s. As silver prices increased markedly through the 1850s, Seated Liberty silver dollars were regarded largely as foreign trade coins. This, among other factors, led to the production of the United States Trade silver dollar beginning in 1873. 1841 Liberty Seated dollars were made only at the Philadelphia Mint. While 173,000 pieces were made that year, few remain today for collectors. 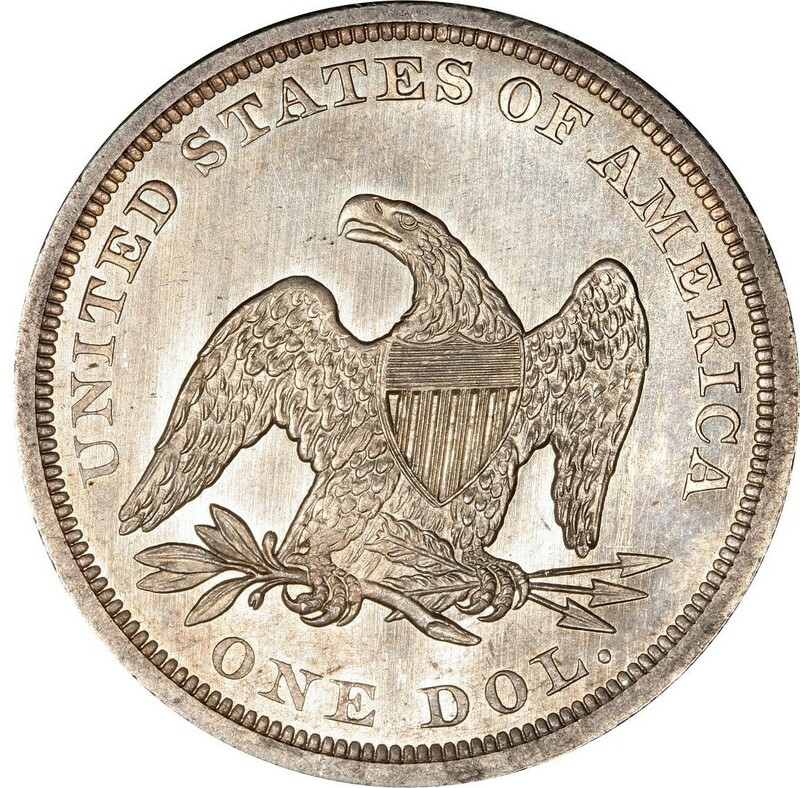 Value of the 1841 Liberty Seated dollar generally range from about $325 for examples grading Very Good-8 up to more than $2,600 for low-end uncirculated specimens. Proofs usually sell for $70,000, and one Proof-64 specimen sold in October 2014 for $94,000. It is very difficult to find wholly original Liberty Seated silver dollars these days. Most Liberty Seated dollars are considerably scarce, even the common dates, and it is even more so challenging to track down pieces that appear to have no problems (cleaning, holes, bends, major gouges, etc.). 1841 Liberty Seated dollars boast a composition that consists of 90 percent silver and 10 percent copper. The coins are 38.1 millimeters in diameter and weigh 26.73 grams. They also contain 0.77344 ounces of pure silver. US 1841 Seated Liberty Silver Dollar NGC Graded VF Details - Great Cleaned Coin!